During my feedback tutorial, In terms of consolidating and linking all of my work together, the tutor felt that to amalgamate the elements of experimentation within my project, I should consider combining my paintings with my tracing paper and photo-manipulation experiments. We talked about the idea of “The Transient City” and how the people around you change and are only around for a short time. There is no time to build conversation or relationships with others in the city. We discussed how this can add to the feeling of loneliness and how the city around you can become overwhelming and a blur. When thinking about the city being a blur, I thought about my tracing paper experiments and how the paper blurs out the background of a photograph. We came to the conclusion that more focus should be put on the figures and how combining tracing paper with my paintings could produce a foggy effect. When thick fog descends on a city, you cannot see anything or anyone else and you feel isolated and alone within a misty atmosphere. I came to the conclusion that combining tracing paper with my paintings would undoubtedly add to the feeling of loneliness within them. I started experimenting but felt that the figures were lost behind the milky paper. I decided to heighten the feeling of loneliness further, I would stick people from my photographs on top of the tracing paper and match them up with the white silhouettes in my paintings. It seemed fitting that I incorporate figure overlays for all of the figures but one. I thought that leaving the coloured figure that is already isolated in my paintings without an overlay would add to the aesthetic of them being singled out and feeling alone amongst a sea of passers by. After experimenting with these ideas, I decided to photograph the result and incorporate the pictures into a faded video. I feel that this clip brings together everything I have learnt and experimented with into a conclusion portraying the fact that it is a sad affair that in the city, people can come into contact with and see others every day but feel out of their comfort zone, lonely and isolated. I think this piece shows how to you things around you might as well be foggy and hazy and to others you might as well be invisible as you go unnoticed and unappreciated. The ideas and concepts at work here emphasise the hidden loneliness of City life and therefore I feel that I have successfully portrayed the concept that I set out to depict and adhered to the brief I was given. I am incredibly happy with the body of work I have managed to create, working with figures was highly out of my comfort zone and showing the feeling of loneliness was very challenging to me. I have really pushed myself this term and I feel that is what undertaking a degree is all about. Within this City project, I was asked to create two final pieces individually, one inspired by the fine art painting project and another that reflects the ideas, thoughts and new processes that I learnt during the collaborative process. As a collaborative we made drawings and stop motion animations. It seemed obvious to me that for this second piece I would like to create an animation that includes drawing to fit in with what I have learnt and worked on with my collaborative group and to portray the hidden loneliness of city life. The collaboration work we made as a group has already informed my individual work and I have started playing around with animations showing loneliness in the city. I thought the experiment I made where all the people were cut out of a photo one by one apart from one individual was quite interesting and had a lot of scope for progression and so I have decided to make a stop motion animation incorporating the manipulation of my photographs to portray inner city loneliness as a final piece. I have included two aspects of loneliness in the city within this piece. The imagery where all the people are cut out/scribbled over/painted in portrays the fact that you might as well be alone in the city when surrounded by others because you interact with no one. If the only people you see are the passers-by of the city then you are going to be highly lonely because you would never converse with anyone face to face. The imagery where only one person has been singled out conveys the fact that you are insignificant which heightens the feeling of loneliness and that to all the other people you might as well not exist. Also, singling one figure out portrays them as being alone within an urban environment. Within this piece, I have experimented with manipulating photos in a variety of ways to show loneliness. I have also included drawing within the piece and the use of tracing paper and paint. I think this piece is very successful and consolidates all the photo manipulation work I have produced throughout the whole of the project. These photo alterations inspired my paintings and kicked off my ideas to create this body of work so it seems only fitting that they make up one of my final pieces. The track that is playing behind this animation is “The lullaby of Loneliness” by Aaron English, chosen for obvious reasons. I have uploaded my final piece to YouTube so it is shared with the public and I can gain feedback from the users of the site. I think this piece is successful in portraying the hidden loneliness of city life and demonstrates a skill that I have worked on from making animations with my collaborative group. 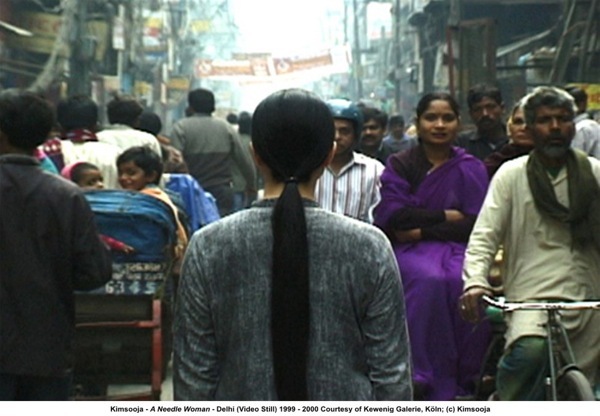 The artist Kimsooja was brought to my attention by one of my tutors. 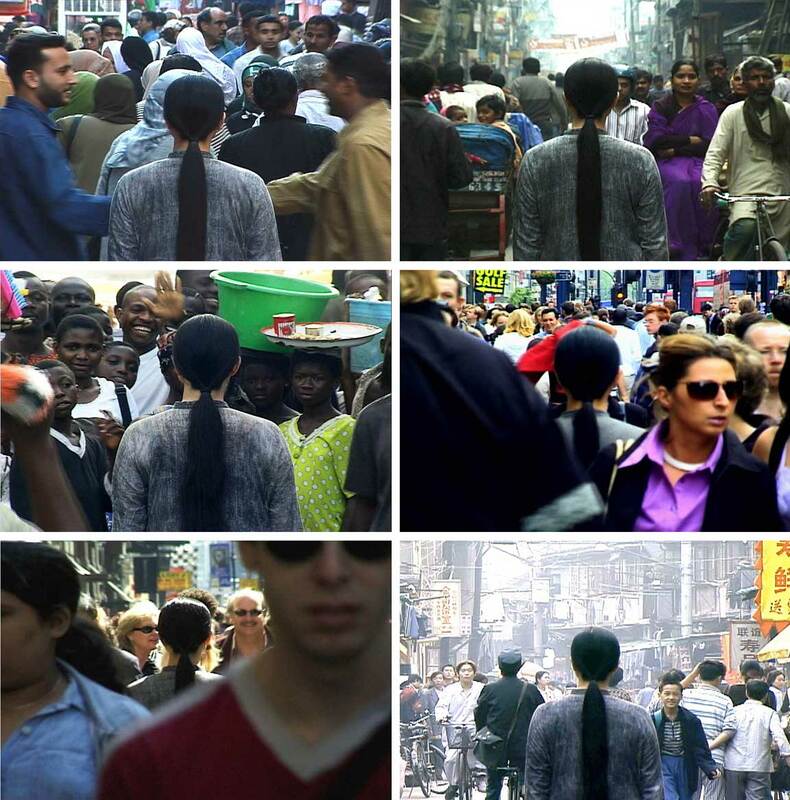 In particular, it was suggested that I looked at “A needle woman”, a video installation of the artist standing in the middle of busy streets in different parts of the world as people pass her by and walk in the direction of the camera. She is a feminist artist and is approaching women’s labour of sewing within this work but I believe it definitely applies to the concept of my city project even if being alone or singled out amongst others in the city was not the artists original intention. This work made me think about the hidden loneliness of city life and the notion of being surrounded by others in the city but alone. She is standing in the middle of many people, but no one is interacting with her, she is being overlooked and people are just passing her by. She is an insignificant figure to them and at the same time all the people around her may as well not be there at all. The feeling of loneliness if highly evident in this work and I believe her video showing herself surrounded by others who are not interacting with her or even acknowledging her existence is not dissimilar to my project imagery of a coloured figure surrounded by white silhouettes. This piece is highly inspirational and influential to my work, it confirms to me that you can be surrounded by others in the city but at the same time singled out and alone. It sort of highlights the ideas I have been working with and in supporting them adds to my works success.